My daughter turned 6 this year. Which is super exciting but also and little wild. She was SO excited for her birthday party. Her birthday just happens to be the day after Christmas. But it hasn't put a damper on her big party dreams. As her Mom, it is my duty to ensure she has a great birthday even thought it is the day after Christmas. And since her cousin and her were born the same day, just 2 hours apart, they get to share their party together. This year both girls absolutely had to have a DIY Unicorn Party. 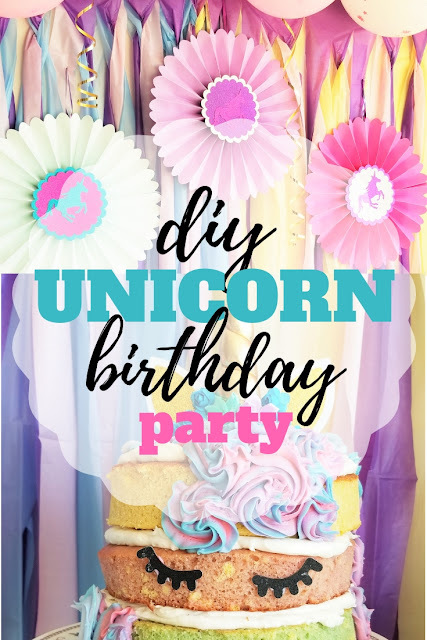 The funny part about the unicorn party is that they both told their mom's independently that they wanted a unicorn party. As far as we know, neither of them had actually discussed their desire to have a unicorn themed party together. It just goes to show they are just twin cousins. So of course, it was my job to make this little party happen. I love to decorate and make each of my children's birthdays special. But when it comes to my daughter's, sometimes I go a little more in depth. I think a lot of it is because it is at Christmas time. I don't want her to feel like she never had a great birthday because everyone combined it with Christmas. However, I also don't want to add a bunch of stress to myself at the holidays. So I try to plan ahead and I use Amazon to help me get the job done. 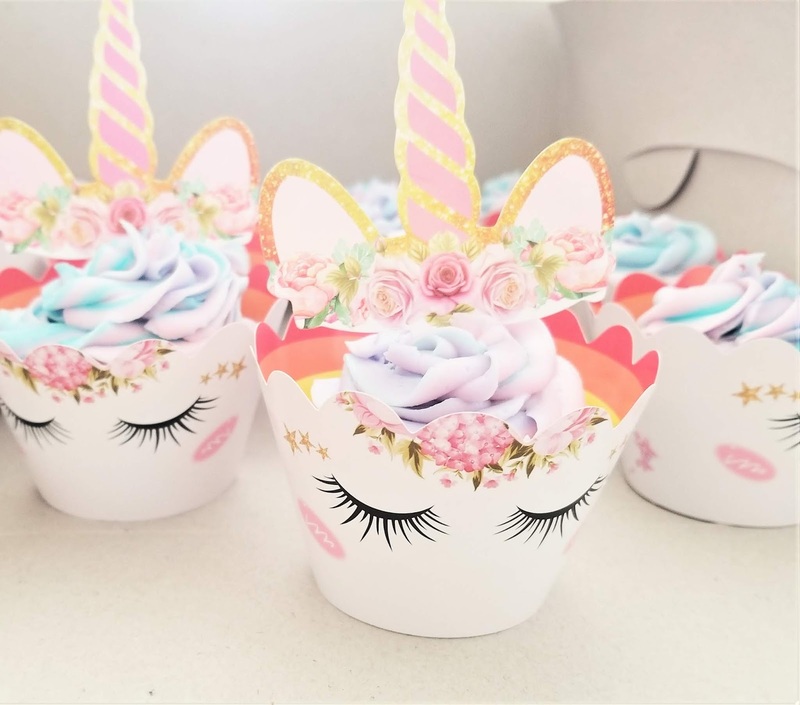 Let me take you through the steps and supplies I used to make this little DIY unicorn party dream come true. 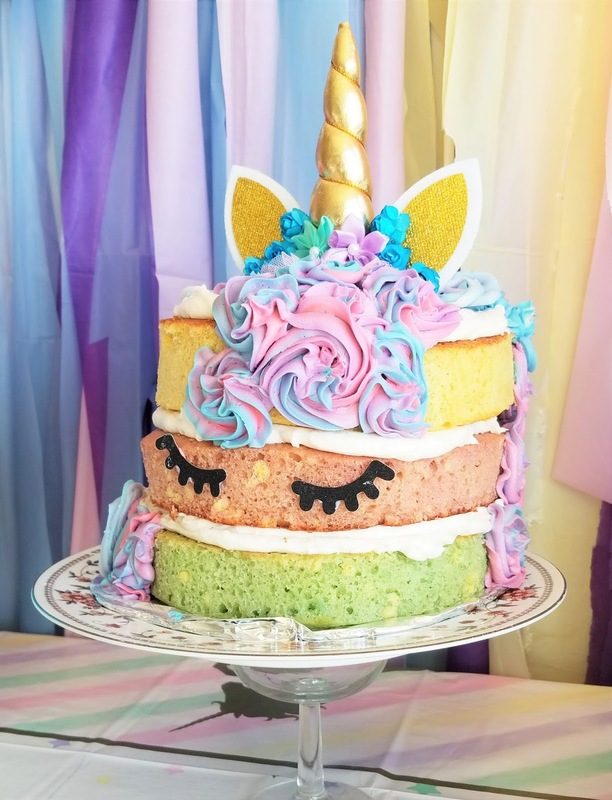 I started by deciding on a unicorn cake for the party. There are SO many great options and ideas out there. 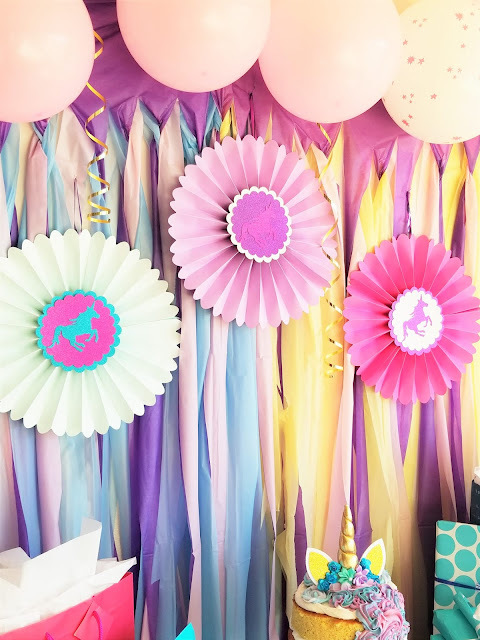 I pinned so many on my Party Board on Pinterest (go check them out). But since this party was the day after Christmas, I wanted something simple that I could do in a couple hours the morning of the party. I decided on an open cake. 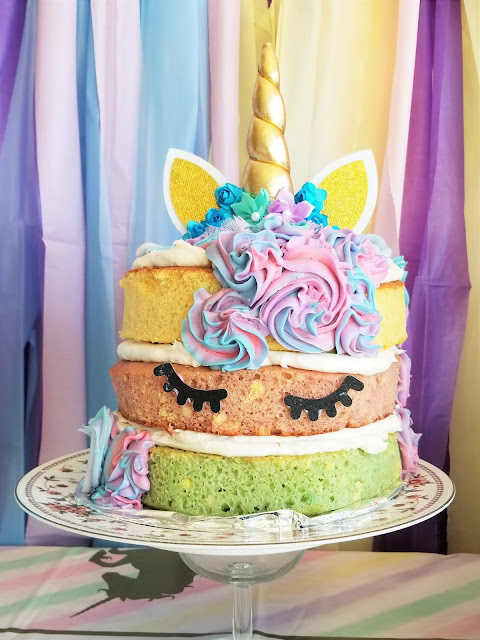 This way I didn't have to frost the entire cake, but it still had fun colors that made the cake seem like a unicorn. I mixed up two boxed cake mixes and divided them into 3 separate bowls. I used the Wilton Icing Colors to mix a green, pink and yellow cake batter. I baked these cakes about a week before the party and than froze them. The morning of the party I pulled the cakes out of the freezer and used a serrated knife to carved around the edge of each cake. This pulled off the browned edges and revealed the pretty colors of the cake. Next I made frosting in blue, pink and purple. Placed them in blobs inside a frosting bag and made rosettes for the mane of the unicorn. Final I added that adorable Unicorn Cake Topper and eyes that I got on Amazon. The whole process took maybe an hour and was totally worth it. Both girls loved their cake. The cake topper also came with cupcakes wrappers. These included the wrappers and the horns to go in the cupcakes. I grabbed both because I also made unicorn cupcakes for my daughter's class to celebrate her birthday. They are really pretty wrappers and some of the kids didn't want to eat them because they were so pretty. For the DIY unicorn party decorations, I wanted to keep it simple but also seem like it took a lot of work. 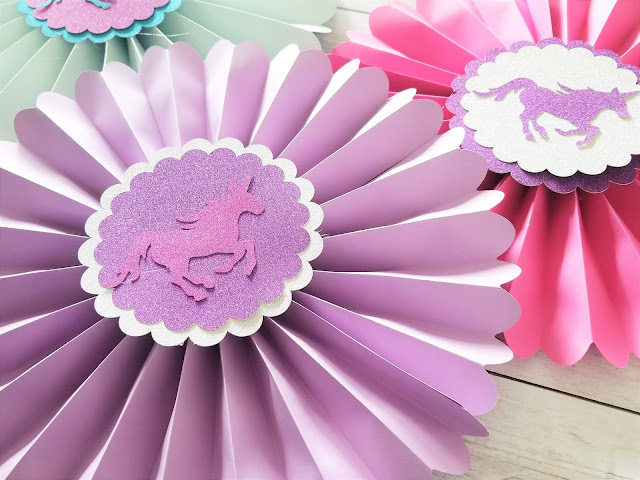 I created a rosette file in Cricut Designs space that I could cut out using 8.5x11" Pastel Cardstock. You could for sure use a 12x12 cardstock, but I wanted specific colors and I could only find them in the 8.5 x 11. Next, I cut out the unicorns and the scalloped circles in this beautiful Glitter Paper. I hot glued all the pieces together and added a ribbon on the back so I could hang them on the wall. You can see the entire video tutorial at the top of this post. Just make sure your pop-up blockers aren't on or you can't see it. 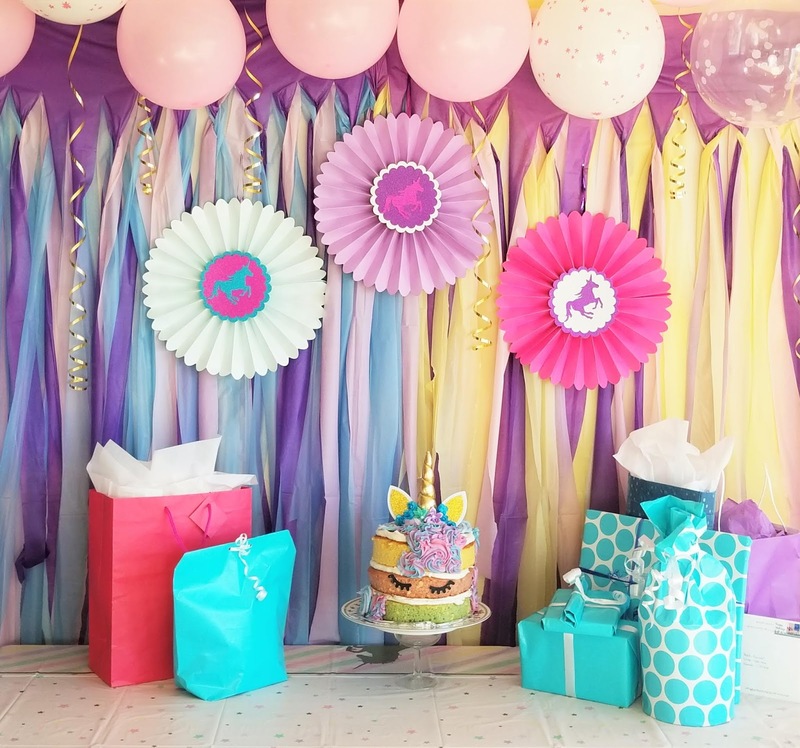 For the back drop of my DIY unicorn party, I grabbed 4 dollar store tablecloths in blue, pink, yellow and purple. I tacked them to the wall and than cut from bottom up about 3/4th of the way every 2 inches or so. Than I braided them at the top. This allows all the colors to come through on the backdrop. You don't want any colors left out. I strung Martha Stewart Confetti Balloons that I got this summer at the Cricut Mountain Make-a-thon across the top and hung gold ribbon in spirals all around just to add a little bit of a pop. Finally, I hung up the unicorn rosettes I had made and the look was so colorful and pretty. It was such a nice change from all the Christmas decorations all around it. 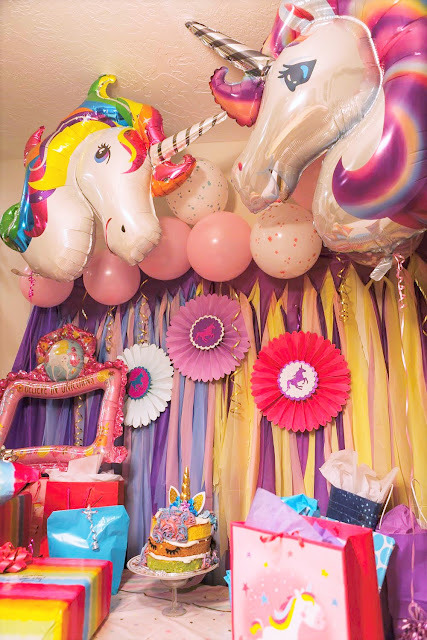 Finally, my sister-in-law brought these amazing Unicorn Balloons for the girls. They finished off the backdrop perfectly. One for each of the girls along with all their fun party gifts. In the end, I am so happy with the final design and how easy it was to put together. Some other things I did consider but end up just not doing because of time. I thought about making some fun iron-on vinyl napkins with unicorns or rainbows. It would have been a fun addition. 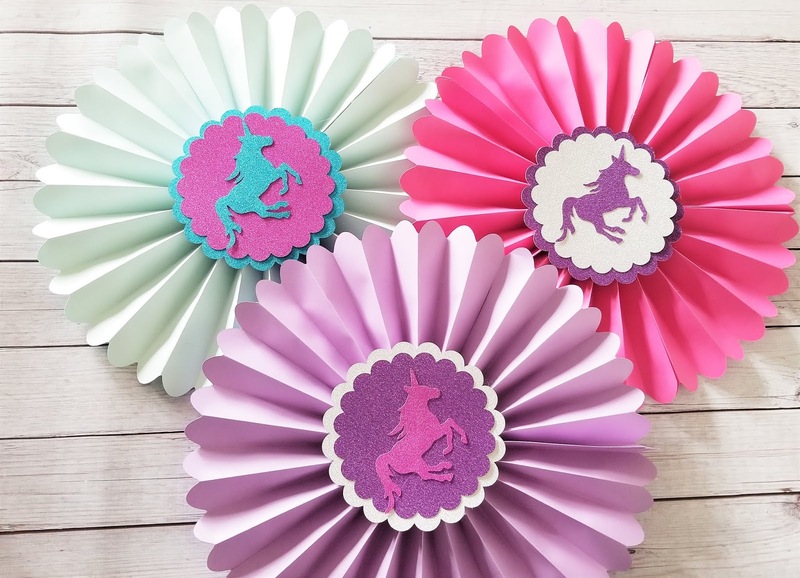 I also found some fun unicorn games on Pinterest, but with the holidays we were not up for anymore games. However, the girls absolutely loved the DIY unicorn party which means it was a success.